The Glen Strathfarrar Deer Management Group lies to the west of Beauly and north of Strathglass. The main core of the Group is formed by the estates on the northern side of Glen Cannich and both sides of Glen Strathfarrar. The Group is bounded to the north by the Strathconon DMG, to the west by Lochalsh DMG and to the south by Affric and Kintail DMG. To the east lies lower ground not forming part of any deer group. 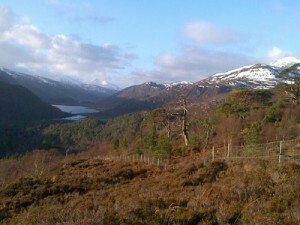 The management area is effectively bounded to the south by Loch Mullardoch, from where a continuous deer fence runs east along the River Cannich, then along the River Glass above the A831 road, then on the eastern boundary the fence continues from Farley in the south through Fairburn in the north. To the north the boundary follows the line of the old county boundary between Inverness-shire and Ross-shire for some distance, then deviates to take in most of the catchment area around Loch Monar, before finally heading south back to the head of Glen Cannich. The Glen Strathfarrar DMG formerly comprised a sub-group of the larger, South Ross DMG, becoming a Deer Management Group in its own right in 2012 following the division of the South Ross area into smaller, more manageable units. The South Ross DMG was one of the first DMGs to be formed back in the 1960’s making this area one of the earliest examples of collaborative deer management. The five DMGs in the South Ross Deer Management Area continue to liaise together. A map of the DMG area is available here.